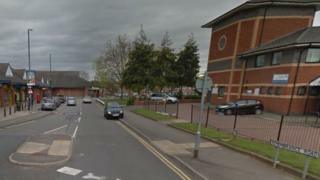 A teenage boy suffered multiple stab injuries during a street robbery in Coventry, police said. The 17-year-old was attacked on Remembrance Road, in Willenhall, just before 18:00 GMT, on Saturday. He was treated for non-life threatening injuries to his chest, arm and back and remains in hospital, West Midlands Police added. Officers said his bag was stolen during the attack. No arrests have been made. A force spokeswoman said: "A 17-year-old boy sustained injuries to his chest, arm and back and has been taken to hospital where he remains today." Police have urged anyone who may have information to come forward.